With a series of events that have unfolded across America in the past several weeks, we can clearly see that the takedown of America is underway. 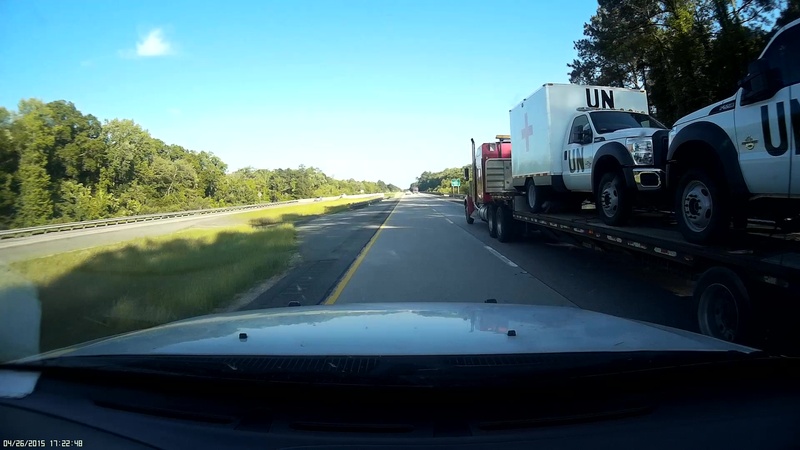 Another set of United Nations trucks (ARMORED!) has been spotted in the deep south while a mayor of a major metropolitan city has given the green light to protesters to destroy property while telling police to back off and allow destruction to take place. Fortunately, no innocent bystanders were killed though 6 officers were injured, the message from the top had been sent - the 'takedown' has begun. With newly annointed civil rights leader Deray McKesson announcing in Baltimore that "this will be a long summer, everywhere" and Baltimore Mayor Stephanie Rawlings-Blake admitting that she ordered police to 'protect protesters, including those who WISHED TO DESTROY', the newly released commercial below from the AARP is getting a ton of attention as an announcement is made within it that martial law has been declared while preparation for that eventual reality is seemingly being played out now across America, with MORE UN trucks being seen in the south as shared further below, before our very eyes. In what seems to be a taste of things to come, Rawlings-Blake ordered peaceful, law-abiding Americans to stay inside of the Baltimore Orioles ballpark because the police couldn't control the protesters, ILLEGALLY detaining Americans so that those who wanted to destroy their city could do so. Combined with the warning from McKesson, selected by the LA Times as one of the leading voices of tomorrow, we can see plans for the future in today's warnings of a 'long summer' and 'shutting down Amerikkka' and the very obvious tie-in to the AARP martial law commercial in 1st video below. All News Pipeline was sent the pictures at the top left of the story and 1st one below videos that show ARMORED UN trucks being driven down the highway in Georgia, just the latest sighting of United Nations vehicles in America. 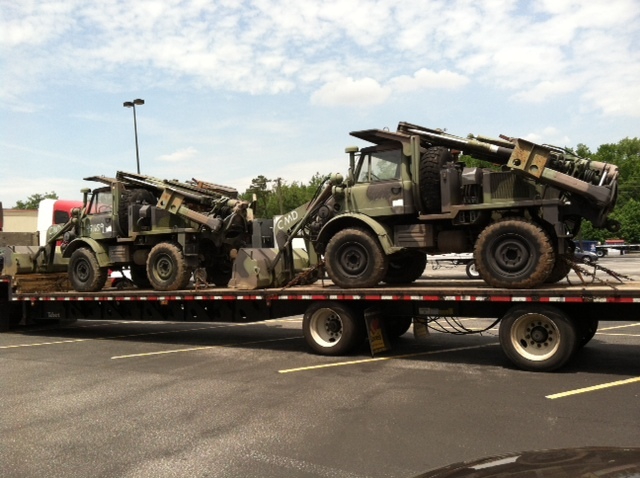 Will these vehicles soon be used by the UN in order to carry out gun confiscation in America? You may ask how we know these are armored vehicles? If you zoom in on the mud flap, you'll see that they were made by a company called SAG: Specialized Armor Group LLC. You can visit their website here if you'd like to buy something yourself to help you prepare for the coming collapse. 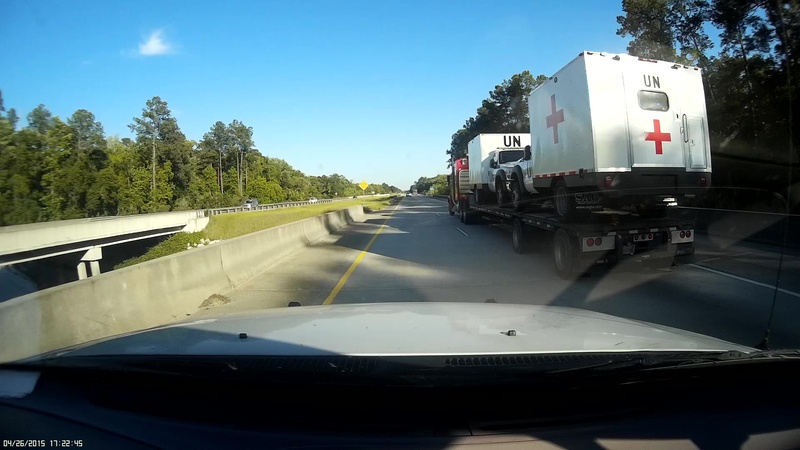 These were spotted on I-16 in Georgia near the 146-mile mark. The 2nd picture below videos shows a car dealership between Chattanooga, Tennessee and Birmingham, Alabama that shows a HUGE number of black and white SUV's that appear to be being readied for government use. The person who took the photographs said that they have been driving this route regularly for 3+ years and had never seen anything like this at that particular dealership before. For those who believe the message heard in the 1st video has somehow been altered, you can listen to the 2nd video yourself directly from the AARP. Make sure to turn up the volume. Why would such an announcement be made within a commercial? Are all of the other events that we have been witnessing across America in preparation for a 'long summer everywhere' in America? 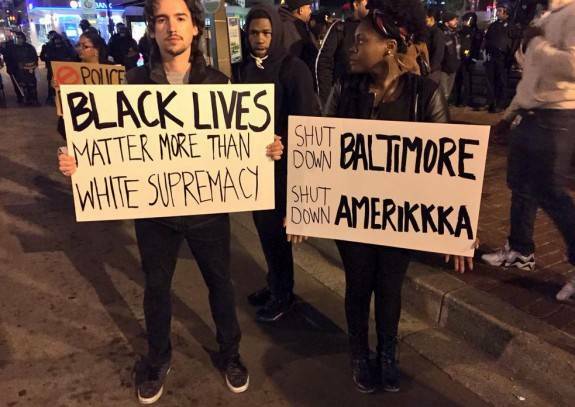 Why would Rawlings-Blake give protesters permission to destroy their city and do the leaders of America have plans to 'bring America down in 2015'? In this video, we learn more about what has been happening in the last several days to show that we've entered the end phase. This is video footage of the UN armored trucks. Why so many recently seen in the southern states of America? Listen closely to Rawlings-Blake at the 7 minute 30 second mark. Isn't she enabling the destruction of property? Why does the UN need armored trucks in America? If they were for overseas there would be a crescent and not a cross.